Despite a century opening partnership APD Dumfries were well beaten at RH Corstorphine in National League Division 2 on Saturday. Chris Bellwood and Jim Patterson put together the partnership against an opening attack that bowled well. However neither were seriously troubled and Bellwood sent one six flying over midwicket to threaten the tennis courts. The, as yet unbeaten, opposition were celebrating a recent coup of Betfair sponsorship but must have been checking the odds after putting Dumfries in and then seeing the scoreboard at 100 for nought. Bellwood was out bowled for an organised 52, his first National League fifty, trying to push on with the score at 102. Then the scorecard took on a completely different complexion. The side were now over the thirty over mark and a good platform still needed someone to play well to take the total on to a challenging one. The cause wasn’t helped when Geary was promptly run out and was then followed by a succession of batsman unable to register double figures and then at 144 opener Patterson departed bowled for 59 to make it 5 wickets down. Corstorphine were able to press home their advantage, including taking a fine catch to dismiss Alan Davidson, and the innings finished in the 49th over when Dumfries were all out for a less than hoped for 163. This wasn’t enough with a true outfield and good cricket wicket to bat on and the league’s top run scorer, their overseas amateur Mommsen, opening the batting. 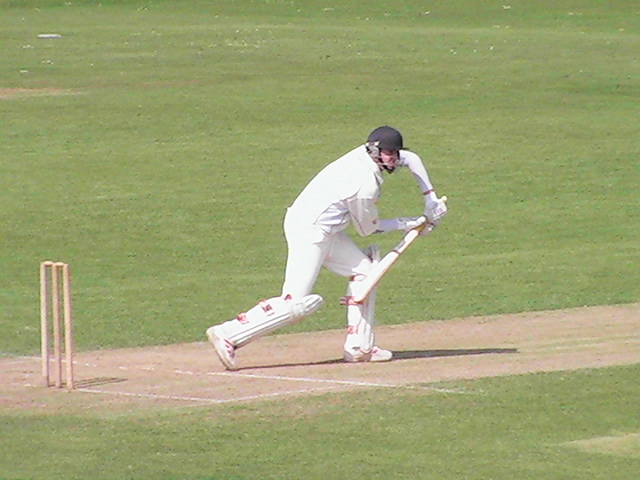 Alan Maskrey bowled a good line in response and claimed a wicket to raise hopes at 15 for 1. However Scotland A bat McClaren partnered Mommsen to take the score to 75 before a chance of pace in the attack from Patterson and Davie Davidson brought a wicket each. They each bowled a tight spell to restrict the run rate but a catch offered by Mommsen on 38 wasn’t taken and that was the last hurdle for Corstophine. Former Saltires’s bat More and Mommsen proceeded to canter over the finishing line to win by several lengths, namely with nearly eight overs and seven wickets left. That was despite eight bowlers being tried who collectively managed to keep unnecessary extras to a minimum. The loss for Dumfries means that the top three sides, including Corstorphine, are now away and clear at the top of the league with Dumfries behind them in fourth place. This week they take on Prestwick at home on Saturday (1pm) and will look to register the double over the Ayrshire side.